If you think about France for a few seconds, what comes to mind? Wine, Fine Food, baguettes, croissants, Paris? Or TGV or Airbus in contemporary terms. Three weeks in a country, happily, enables you to dig deeper than a quick business trip. There are special traits that will either endear you to a country or possibly irritate you. Just when you think the traits of a country you recall fondly from childhood are gone, you experience the mountains of Southern France and its people. Recent days have seen us traverse from Paris, through the splendid but fairly poor region of the Allier, and north-east again to Dijon and the Burgundian wine country. 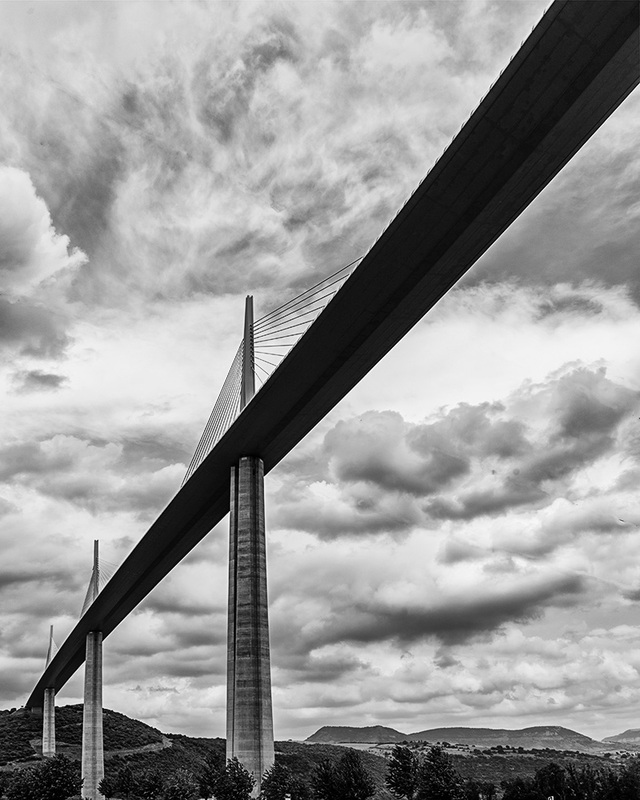 Then, in a 600km dash, via Lyon, across the Massif Central to home of Michelin tyres, Clermont Ferrand, we arrive at the most amazing of human structures, The Viaduc de Millau in the Midi-Pyrénées. From here we head east, up steep, narrow D-Roads, around breathtaking curves and drops of 400 metres or more beside the road. Then it’s across a rolling plateau, farmed in small parcels of multi-patterned lands, and finally into the valley of La Dourbie river and the sleepy village of Saint-Jean-du-Bruel, 30 kms east of the world’s, highest bridge, and a century behind in way of life. 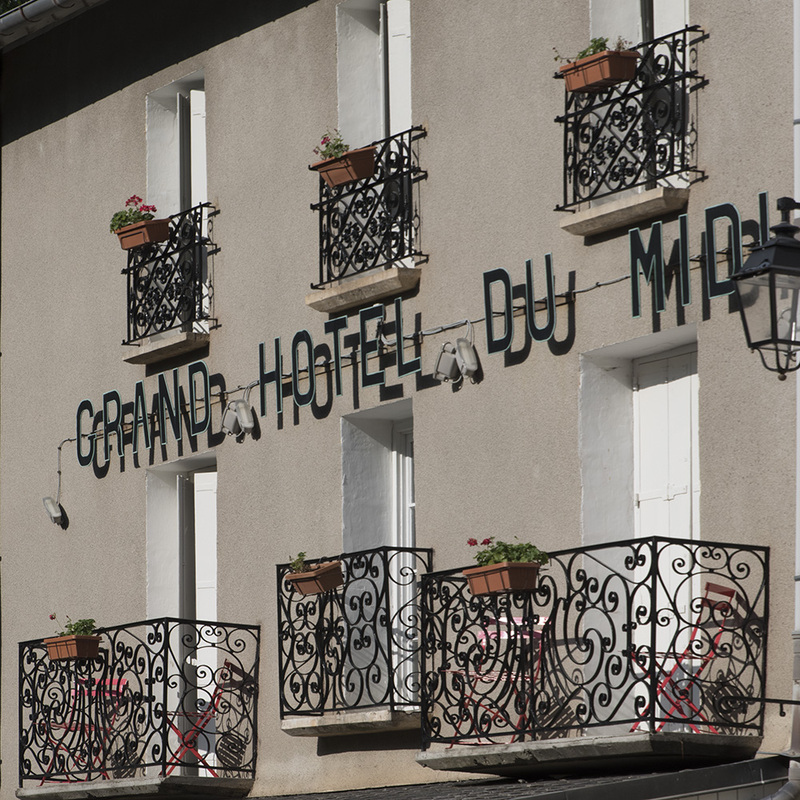 Our destination is the Grand Hotel du Midi, Papillon restaurant. It has the added bonus of 18 diminutive rooms. The restaurant has been recommended to us by a family member in Paris. We are warned about the simplicity of the rooms, but assured that the food is excellent. It’s late afternoon. The sun is shining brightly. It’s unexpectedly humid. Evening thunderstorms are forecast. We wander in past the bar, having expected a front desk. There really isn’t one. Nor is anyone about. I venture into the adjacent dining room and then sitting room. No-one there either. But all tables are set for dinner, so something is happening. A muffled “Oui monsieur?” emanates from one of those two-way doors preferred by restaurants for quick bi-directional access. Madame appears, dressed in simple black, carrying some required utensils to complete the evening table settings. I explain our name and the reservation made by phone two days earlier. Internet booking was not an option, despite a 4-star Trip Advisor rating. It’s becoming clear this is a hostelry steeped in history where the clock stopped some decades back. Madame puts down her loaded tray, grabs a key from an otherwise-empty line of hooks and asks us to follow. I suggest she might first want our credit card or an ID. She almost frowns back, “As if!” We are duly led up a dark staircase, past two impressive pieces of Victorian heavy-set furniture on the landing, through a felt-covered door, where automatic lights lead us down what would have been an even darker and narrower passage. We arrive at a doorway, accessed with an old-fashioned brass key fob. Opened, the paper-thin door reveals a double bed, a tiny desk and two tiny chairs. A cotton drape (no door) covers an adjoining annex containing the small bath and the basin. Within IS a door: For the toilet. Of course we nod approvingly. We have driven seven hours to be here! Despite a briefly sinking heart it’s not the time to seek something elsewhere, even if we had the energy to move on. We drag up our bags. No room to unpack, just open them. I depart to walk the village and assess photo opportunities. I amble past a café/bar, with a solitary drinker sheltering from the evening heat within. Next door a fine old country church, with no less than fourteen stations of the cross located on the wall.On the opposite side a freshly painted new-looking restaurant presents. Competition for the Papillon ahead? Next door there’s a completely derelict former hotel. It’s just sitting there. 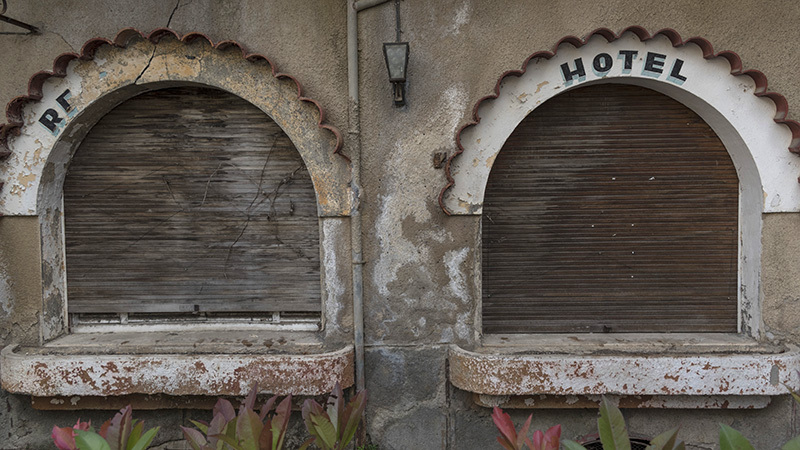 No ‘À Vendre’ sign, -a building just showing its cracks, the peeling vestiges of a painted window frame and a build-up of lime deposits, where water has dripped for what looks like decades, forming even deeper fissures in the already cracked walls. We learn the next morning from the junior school teacher who we encounter in our morning walk, that this once-fine establishment was closed as the result of a family dispute. Failure to repair has been a decades-long family fall-out, reportedly, with no family member agreeing to sell to another so they can move forward. Strangely familiar. The rot continues. Irreversible damage lies ahead. Our informant also tells us that his school can only provide for children until 11, of whom there about 25. Above 11 years of age they have to go an hour’s bus ride to a 35km distant town. What those journeys must be in freezing winter snows on those treacherous mountain roads. I return to freshen up for dinner. I squeeze into the tiny bath with no shower curtain, but a fine hand-shower wand. Duly refreshed we descend in time for the mandated 7.30pm start of dinner. Within 10 minutes, as if from nowhere, all the tables are occupied. The sound of multiple languages exchange views and agreeable nods from a fine wine list and the reputed prospect of local fare. The meal is abundant, of wonderful quality; the terrine ambrosial, The beef Plat Principal is as good as I have ever eaten. Boeuf au capucin – literally in dripping-replete with wonderful scorched, caramelized depth of flavour. The special rhubarb Tarte Tartin has a freshness and inventiveness to rejoice in. I look for someone with whom I can sign the bill. Madame reappears and waves away the suggestion. Again no accounting apparent. Trust. Is this really possible in this day and age? How wonderful. “Je suis Ramadier.” He goes on – (in French). “It’s the same name as a former Prime Minister. I met him once, actually when I worked in Paris.” His seated height was only marginally less than his standing height. 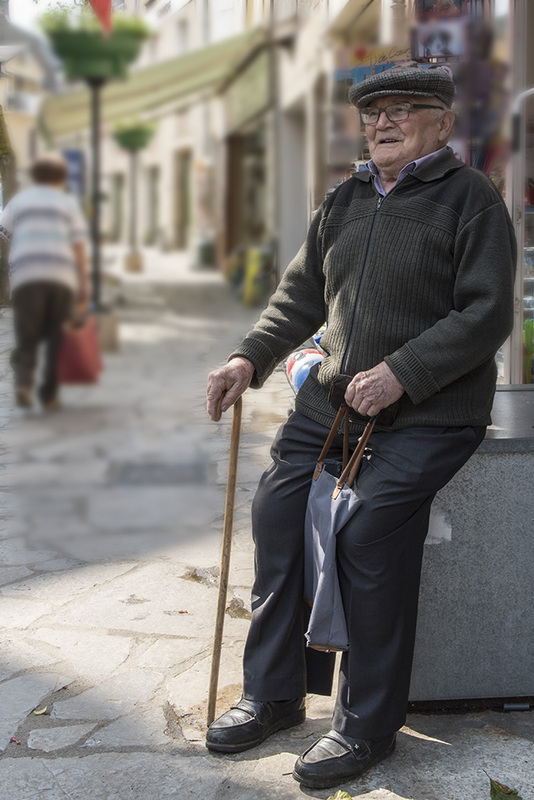 He was chatty, as older people often are. When we tell him we are from Australia he suddenly launches into fluent English. He tells us a good friend had spent two years in Brisbane studying years ago. The world really is very small. I longed to learn more. But we had to be on our way. That meeting he referred to must have been a very significant one for him. His namesake, Paul Ramadier, was Prime Minister in the Fourth Republic government of 1947 – a past hero of the Resistance. Chance meeting – very special. That night we are taking a walk after another sumptuous meal at the Papillon. 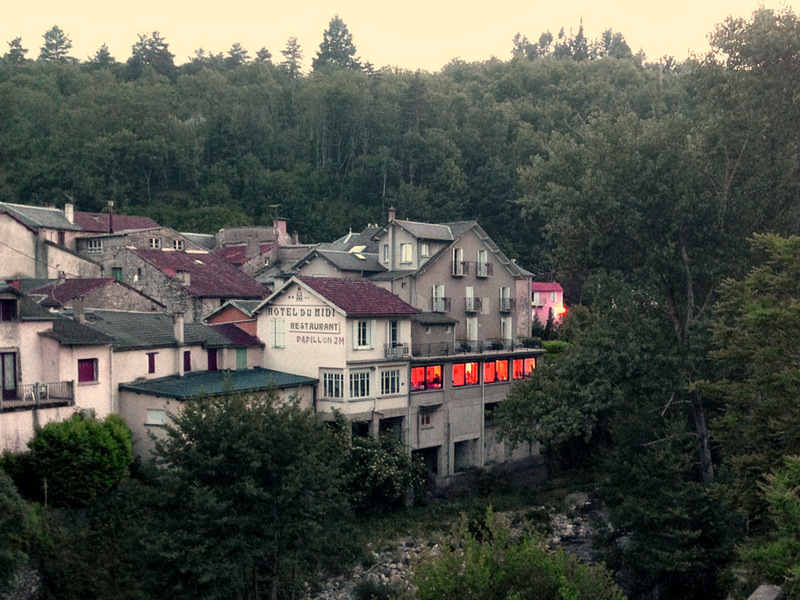 As we walk across the bridge and pause to look back on the hotel below, a car pulls up. A Man in black emerges and smiles warmly at us. He says he saw us leaving the hotel earlier. I now recall his passing car at the time. He proudly informs us he has just been to the allotment on the far side of the river bank, where he grows the produce he uses in his kitchens. Too many customers tonight! I needed more vegetables. No all-night supermarket here, except the fields in which real produce grows. A reassuring element of country life, abundantly well. Our departure from Saint-Jean-du-Bruel the next morning sees us standing at the little counter beside the bar. The seated young lady gets out a Duplicate book (remember those?) and duly records our dinner details from the night before, our Petit Dejeuner of this morning and hands us the bill. The accommodation, it turns out, was just €45 a night. We had forgotten to ask the room rate, due to the unusual arrival procedure. Suddenly this cramped room and its limited facility felt like the best value ever. The young lady also confirms she is the daughter of our host of last night and the eager her, buying out her mother and father, together with her husband. They are going to be the sixth generation owning this property. The Prelorenzo family tradition continues. One suspects a computer system might be a future addition as a mark of change. The real values of this committed family will assuredly continue unabated. A road, as poet Robert Frost so aptly recorded, ‘less travelled by’, -so richly rewarding. A delightful descriptive narrative. What a contrast between the viaduct and the village! I have made similar encounters as you have described in parts of rural France including the Central Massif. I am saddened that I missed so much because of my failure to learn French in Mrs Brown’s class at Parramatta High. Clearly you are an astute observer of people and place. Travel well my friend. Be safe. Next Next post: How pleasant to know Sir Christopher Wren!